A remedy for many conditions. Organic Black Seed Oil Nigella Sativa For over two thousand years the black seed (Nigella sativa), a plant from the Ranunculaceae (buttercup) family, has been traditionally used by various cultures throughout the world as a food and in health and general wellbeing. The ancient Egyptians knew and used the black seed. Tutankamun is even believed to have had a bottle of black seed oil in his tomb – and that would have been organic of course! Probably ineffective though as it has been described as "a remedy for everything except death"!! 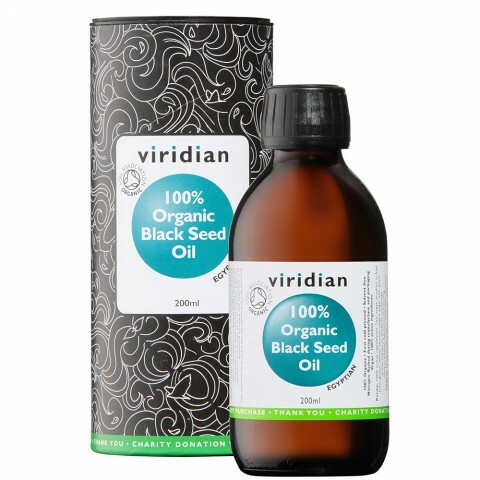 Organic Black Seed Oil from Viridian Nutrition is of the highest quality, made exclusively from organic Egyptian black seed, cold-pressed and bottled in amber glass bottles under a blanket of nitrogen to protect the oil from air and light. Organic Black Seed Oil from Viridian Nutrition is certified organic by the Soil Association. Organic growing is better for the planet, better for you. Organic standards ensure that the black cumin seeds in our Black Seed Oil are grown without the use of synthetic pesticides of other chemical sprays. Organic growing works with the planet instead of against it. The organic farms for our black seeds are all in Egypt ensuring the highest quality. Nigella sativa is an exotic addition to Viridian's extensive essential fatty acid range. Also known as the Blessed Seed, black seed is popular in the Middle and Far East. With a pleasant aroma and taste, it can be taken internally off the spoon, used as part of a salad dressing or used as a head or chest rub. Viridian’s Organic Black Seed oil is vegan, organic and certified Kosher, guaranteeing the highest quality black seed oil available. Organic Black Seed Oil is part of the 180+ award-winning range of nutritional supplements and beauty products from Viridian Nutrition. Organic black seed oil 100%, Linoleic acid (Omega 6) 2450mg, Oleic acid (Omega 9) 1040mg. Directions: As a food supplement, take one teaspoon daily or as directed by your healthcare professional.Ê This highly nutritious oil can be added to fruit or vegetable smoothies, salad dressings, dips, soups or as a condiment drizzled onto vegetables, pasta, rice, potatoes etc... or just taken from the spoon.Ê This pungent oil can also be used topically as a traditional massage oil and as an aromatic chest rub.